Nippon Express and Bluebird India have entered into a joint venture and are claiming to be the fastest in the business of fixing scratches on a car. Nippon Express ensures same day delivery of your car. Nippon Express is a velocity car scratch repair service. It is a 20 step process which just takes a couple of hours. Nippon Express ensures same day delivery of the car. 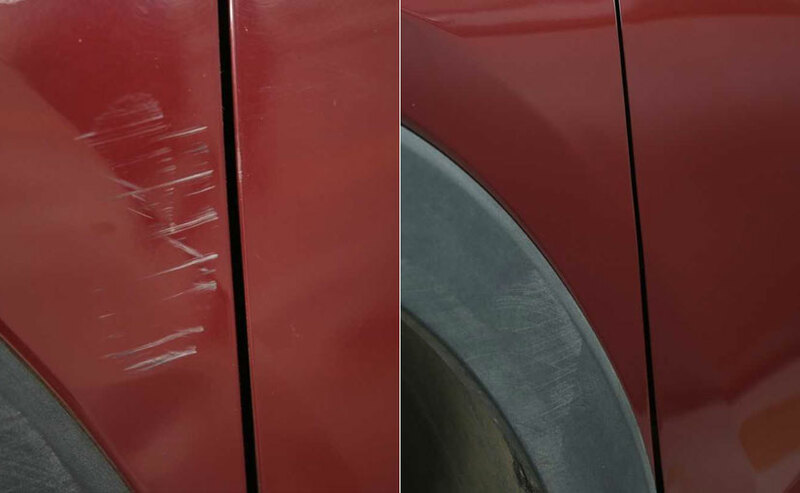 A scratch on your car is disheartening to see and many times you are clueless about how it happened. It's something you cannot escape specially in the overflowing traffic of metro cities. However, we have good news for those who just can't resist a single spot on their car and want to erase them as soon as possible. Nippon, a Japanese auto component manufacturer and Bluebird- an Indian brand which specialises in servicing of luxury cars have come together with a regulated high-quality paint job and car care service. While there are other players in the market too who provide similar services like Bosch, Cartisan, Car Care India, Car Crew and CarZ among others, Nippon Express claims to be the quickest among all of them in removing scathes. Since we already had a car with us which needed some refinishing, we deiced to test the service ourselves. We took our Hyundai Tuscon to fix a minor scratch on its left fender. Nippon Express is a velocity repair service and is a 20 step process. Nippon Express is a quick car repair concept which is a 20 step process. It starts with washing the car, using the de-greaser to remove dirt, oil, grease and other particles. Then, the car or the panel that needs to be re-painted is sanded after which the body filler is applied on the surface. After the body filler settles, the car is completely masked for curing the body filler and then the scratched area is sanded again. The sanded part is again cleaned using a de-greaser before the car is made ready for the primer application. To be specific, the body filler and primer solution that Nippon uses are the components that get the job done quickly. In conjunction with the sand, they settle down within 25 minutes whereas normal primer coats may take over 90 minutes to settle under normal temperatures. 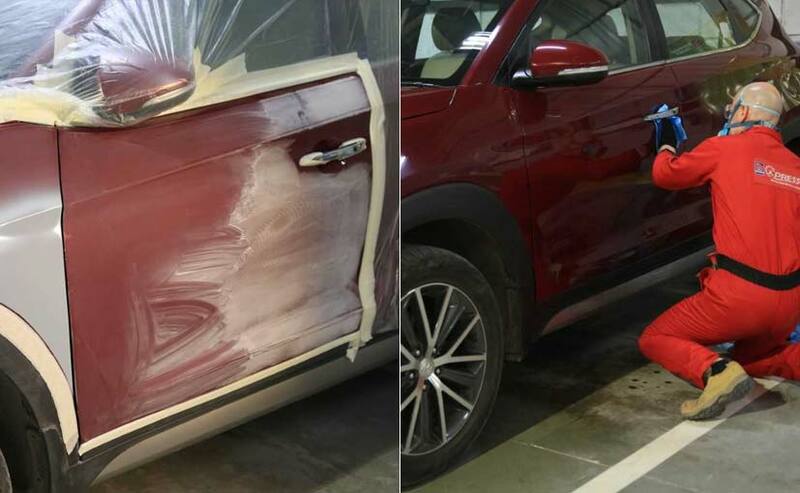 After the basecoat is applied, the car is taken to the spray booth wherein the new paint is applied. While the process is ongoing, the paintjob specialists take a sample of the paint to make the exact shade. 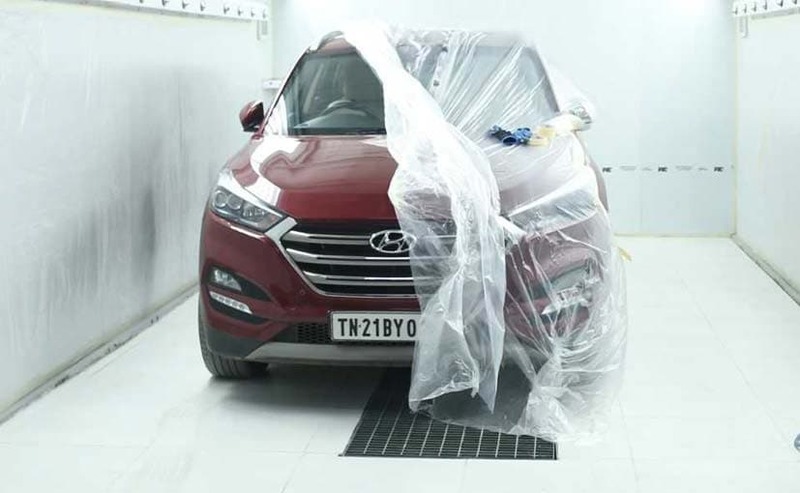 Once the car is ready for the basecoat and clear coat application, it is taken to the spray booth wherein the new paint coat is applied and is cured for up to an hour at different temperatures. Nippon claims that the duration for the entire process of fixing a particular panel in 100 minutes. In our case, it took a little longer, about 130 mins. However, the team is impressively quicker than any other body shops we have been to so far. 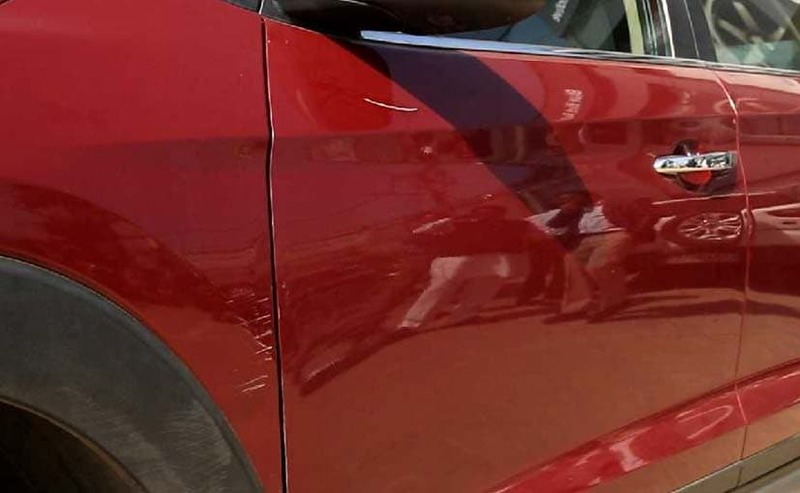 The scratch on our Hyundai Tuscon was fixed and it took around 130 minutes for the entire process. The scratches that were earlier on our car were completely erased and the body panel that was re-painted had a glare to it. Also, the best part is that you get the delivery of your car the very same day. For all the work done, the appropriate cost is ₹ 4000 (excluding taxes) which is a tad more than some of the other regulated body shops and almost twice the price you pay to the unregulated bodywork mechanics. That said, for the quality and express service Nippon offers, it is a fair asking. Moreover, Nippon also provides pick-up and drop service at no additional cost so that your plan for the day doesn't go for a toss.